Jennette Marie Powell is the author of several time travel and paranormal romance novels. A lifelong resident of the Dayton, Ohio area, she likes to dig beneath the surface and find the extraordinary beneath the mundane, whether in people, places, or historical events. While she has no desire to change the past, she enjoys learning about local history, particularly the early 20th century. Her preferred places to time travel are from her computer or Dayton’s Carillon Historical Park. By day, she wrangles data and websites in between excursions to search for the aliens and spacecraft that legends say are stashed away on the military base where she works. 1-	How old were you when you fell in love with reading? Can you remember what book/ books it was that inspired you? I can’t remember NOT reading! Or at least, being read to. The earliest favorite story I can remember is “The Cold-Blooded Penguin,” which was in a book that was part of a four-volume set of Disney stories. This story is about a penguin who couldn’t stand the cold in Antarctica, and finally pursued his dream of moving north by cutting a big boat out of the ice. My parents read that story to me so many times I’ll bet they can still recite it word for word! I blogged about it not too long ago. 2-	What is your favorite guilty pleasure book? The one you’re embarrassed to let other people know you read. Come on you can tell us we’ll keep it a secret. Well, it’s not really a book. I don’t feel guilty reading any of them! The only thing I can think of is web comics and blogs, because I usually read them at work – while taking a break, or waiting for a slow process on my computer, of course! If I’m stuck at work with nothing to do (hasn’t happened lately, thank goodness! ), I’ve been known to get into some nice, juicy WWE fanfic. I am a fanfic fan too. 3-	When the zombie apocalypse comes what is going to be your weapon of choice? I think I’ll just go hide in my daughter’s high school. According to her, there’s so little brain matter there, I doubt the zombies would go near the place! 4-	If I was bitten by a zombie I have a list of people I want to bite. Who’s at the top of your list? Politicians! Starting with the ones who keep calling my house. No, I’m not voting for you. Go away. OTOH, maybe not – if I’m looking for brains, my chances are probably better at my daughter’s school. 5-	We’re all supposed to be eating healthy, but what naughty treat tempts you the most? Mountain Dew! It’s soooo bad for you, and soooo yummy! Plus, you can’t beat that awesome combo of sugar and caffeine for a wakeup after lunch. I do limit myself to one can a day, though. I’ve never gotten into soda- but it sounds addictive I think I’ll stay away just in case. 6-	Naughty- confessions, what TV show do you love but hate to admit to watching? Well, as you might guess from my comments above, that would definitely be WWE wrestling! All those hawt, muscular guys in tight pants! Add in the ridiculously absurd story lines, and who cares if it’s fake? Unfortunately, watching WWE is something I haven’t had time to do much of since I published and kicked my writing into higher gear, so I don’t know any of the story lines they’re doing now. 7-	What do you love most about your current book? I love taking supposedly ordinary people in an ordinary place, and giving them something “extra” – in this case, a psychic time travel ability – and throwing them into extraordinary situations that they go through hell to get out of. And believe me, they do go through hell in prehistoric Ohio in my upcoming release, Time’s Fugitive. Time travel is so interesting, I love it. 8-	Give us a super secret peek into what you’re working on next? Oooo sounds really good. I can’t wait. 9-	What style of book do you secretly long to write, but are afraid to try and do? I would love to write something uproariously funny! Yet, while I love comedy books and movies, I can’t write funny to save myself. Oh, there are amusing moments in my books every now and then, but that’s as much as I can muster. But as long as my readers enjoy my dark-and-serious stories, I’m good with that! Comedy requires such great timing. It would be a challenge to try and write it. Tony Solomon never wanted to be a time traveler. But when a freak accident gifts him with the ability to travel in time, he becomes an unwilling initiate in the Saturn Society, a secret society of time travelers. Determined to prevent his daughter’s murder three years earlier, he violates the Society’s highest law and becomes a fugitive. But the Society refuses to tell Tony how to time-travel within his own life, so he seeks help from Charlotte, the woman whose life he saved during a prior trip to the past. 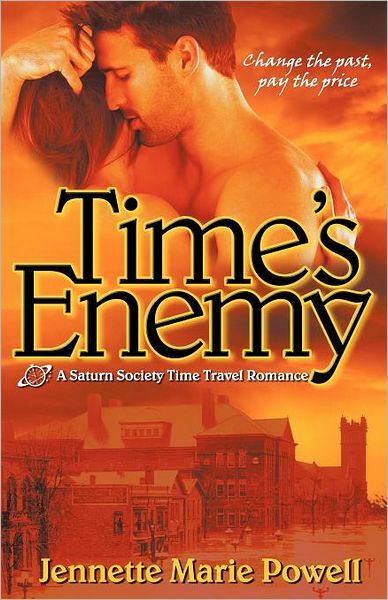 Time’s Enemy is available in ebook and print at Amazon, Barnes & Noble, Smashwords, and many other online retailers. I know now that you have found out about Jennette you want to join me in following her. You can find her at facebook, twitter Goodreads, and her blog. That sounds like a great book! Just added it to my to-read list. Nice interview, too! Alicia, thanks for having me here today! Sorry I wasn’t able to stop by earlier – busy day at work, and I wasn’t able to get on my phone. August, thanks, and thanks for stopping by! Marlene – thanks for checking it out – I hope you like it! Debra – I can soooo relate! There are so many fantastic books by my writing friends. I hope you have a chance to try it soon! And Alica, I just realized that I’ve been putting an extra “i” in your name for months! :facepalm: So go ahead and put that “a” in Jennette any time you want – I have it coming to me! Definitely going to get this book. Will you autograph it for me Jennette, please? Enjoyed the interview! I have wondered sometimes who drinks Mt. Dew. It’s VERY caffeinated. Of course, I have no room to speak with my 2+ Dr Peppers a day. I love the idea of setting a book in prehistoric time in your own area. That must have been fascinating to put together. Thanks, Alica & Jennettte! Oh yeah, and I even added an extra “t” to your name, Jennette. Oops. Sorry.